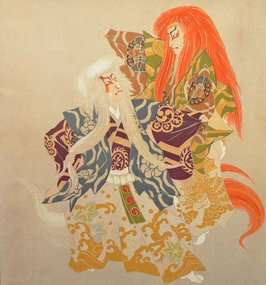 Japanese Fukusa Panel Depicting Two Kabuki Actors Performing the Lion Dance. 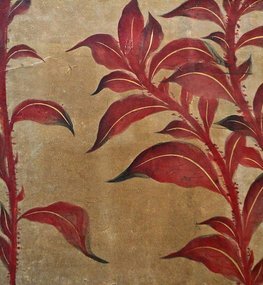 Polychrome and Gilt Threads. A fantastic painting with wonderful movement and lush color on chirimen silk. 26w x 24.5h inches, 66 x 62.25 cm. Framed. Japanese Koto Cover featuring a magnificent Phoenix. The Koto is a traditional Japanese stringed musical instrument. This Koto Cover was for an important Koto player. A textile of this quality rarely comes along for sale. Beatifully hand painted with some embroidery on fine silk. Really a work of art. 96 x 13.5 inches, 244 x 34 cm. Excellent Condition. From a prominent and widely exhibited collection. A most unique pair of Chinese Pig Skin Trunks, obviously painted by a Japanese screen artist who made these wonderful decorative, rare creations, featuring a marvelous crane and flowers painted in the Japanese style. Late 19th to early 20th Century. 22w x 9.5h x 13.5d inches, 56 x 24 x 34 cm. Japanese Meiji Period painted poloma wood door (sugido). Ink and pigment on a natural wood ground, depicting a peacock perched on a flowering cherry tree, signed/sealed Sho[ryo], the reverse with scattered cherry petals floating near a flowering dandelion plant. Possibly featured in a retreat of the upper class. Height: 70.75 inches, 180 cm; Width: 34.25 inches, 87 cm. An exceptional Pair of Small Japanese Six Panel Gold Leaf Screens that were part of a Girl's Day Hina display. They depict Imperial children playing in a beautiful setting. Wonderfully detailed paintings and a fresh image of childhood. They are in near mint condition, unusual for their age. 31w x 13 h inches, 78.5w x 33h cm. This rare 19th Century Bunraku Puppet of Osome, and rare scroll painting of Osome came from a private collection of theater art in Japan. 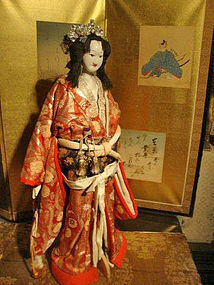 The puppet is a heroine in the play, Shinpan Utazaimon Nozakimura no Dan (Osome Hisamatsu). It is made of wood and covered with many layers of gofun (crushed oyster shell), with painted features, dressed in a sumptuous brocade silk kimono and obi. Her head moves up and down, and from side to side. Bamboo stand is included. The painting on paper, with ceramic roller ends, is from the same play and is signed Joruri. Scroll: 50 x 22 inches, 127 x 56 cm. Bunraku Puppet Height: 25 inches, 63.5 cm. 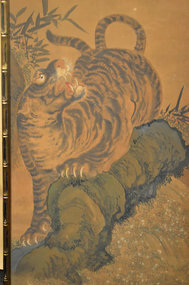 Japanese Framed Painting of a Tiger. This dynamic image is a classic example of fine Japanese painting. A wonderful work of art to behold. 47 x 17.5 inches, 119.5 x 44.5 cm. 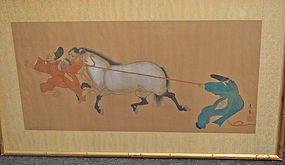 Late Edo Period Japanese Painting of Two Men Pulling a Horse. This classic Kano school painting is a perfect composition of line and form and color. Frame: 35 x 20.5 inches, 89 x 52 cm; Painting: 28.25 x 13.5 inches, 71.75 x 34.25 cm. Colors on silk. Signed and sealed by Kosui. 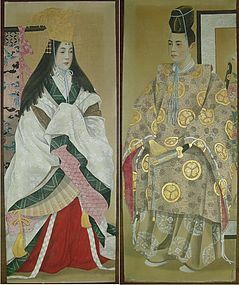 Pair of Spectacular Masterpiece Japanese Paintings of an Imperial Couple. 59h x 24w inches, 150 x 61 cm. Signed: Nakayama Sanji. Original frames. Male figure wears robes with the Tokugawa crest. The female wears a gold phoenix crown with a gorgeous royal kimono. This one-of-a-kind pair of portraits was possibly inspired by the American painter, John Singer Sargent (1856–1925), considered the leading portrait painter of his generation. His portraits have a elongated format, similar to this pair of paintings. Exhibited at Chicago World’s Fair in 1893. Set of Six Japanese Meiji Dynasty Imperial Portraits. Each painting is 59h x 24w inches, 150h x 61w cm. 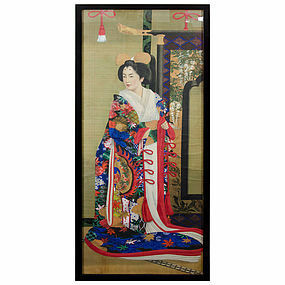 Japanese Edo Period Four Panel Screen Painting of a Court Scene. This elegant image is finely painted with floating gold leaf clouds, pine and willow trees, and brings the viewer into the intimacy of the court chamber. The figures are wonderfully animated with expressive faces. 100.5 x 36 inches, 255 x 91.5 cm. 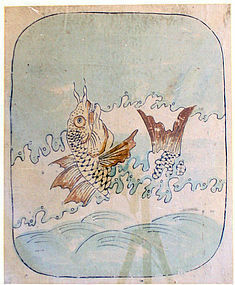 Fine Edo Period Japanese Folk Painting of the Legendary Carp who Becomes a Dragon. According to the legend of the Dragon Gate Waterfall, carp gather downstream and try to swim upstream against the current and jump up the waterfall. The carp that succeeds is transformed, in a flash of lightning and thunder, into a dragon. The phrase “going through the Dragon Gate" refers to advancement and success. The carp in this painting dreams of becoming a dragon. Paintings like this were hung in young students’ rooms to motivate them to pass the civil service examinations (and nowadays, college entrance exams). Once transformed from a persevering carp, the mighty dragon ambitiously chases through the clouds after the yeoiju, the flaming magical pearl of wisdom. There is also wise counsel in this painting for the young student in the idea that fish never close their eyes, even when they are sleeping, which symbolizes eternal vigilance. The black lines at the bottom are the reflection of the camera tripod in the glass frame. Frame: 27 x 22 inches, 68.5 x 56 cm; Painting: 16 x 13 inches, 40.5 x 33 cm. From the Lea Sneider Collection. 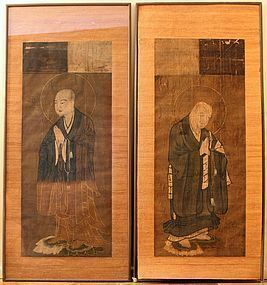 Pair of Antique Japanese Monk Portraits. There is a reflection at the top of the painting on the left that makes it look like the mounting is cut off diagonally several inches from the top of the frame. Again, this is just a reflection, and the mounting is complete and is the same size as the painting on the right. As to be expected in paintings of this age, there are tears and loss in both paintings, including two long tears across the top of the painting on the right. Each frame: 53 x 24 inches (134.5 x 61 cm), each painting: 41 x 17 (104 x 43 cm). 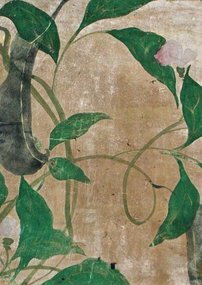 Genuine 17th Century Early Edo Period (possibly Momoyama Period) Japanese Floral Rimpa Painting made from Pigments, Silver and Gold. This is not a print or reproduction. Authenticity is absolutely guaranteed. Custom mounted for display. Painting: 12.75 x 2.25 inches, 32.5 x 6 cm, Mounting: 17 x 6.5 inches, 43 x 16.5 cm.